They are pure casters that have both offensive and healing magic. 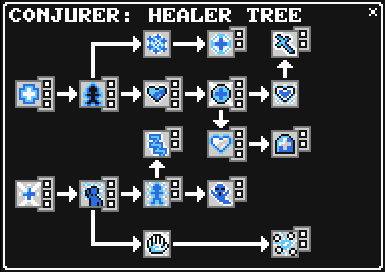 The majority of their spells are based upon damage or healing over time. Conjurers can equip Orbs and certain Staves and are limited to cloth armor. In their offhand slot, Conjurers equip Books which offer stat boosts and in some cases also offer spell charges. Quickness - - 2 +1 to Agility for every 3 levels. Lucky - - 2 +1 to Luck for every 3 levels. Bolster Fire 5 Quickness (2) 2 +20% of equipped weapon Enchant Power added to Plus Fire. Ability: Gust 5 Bolster Fire (1) or Bolster Ice (1) 1 Inflicts direct Storm damage. Bolster Ice 5 Lucky (2) 2 +20% of equipped weapon Enchant Power added to Plus Ice. Extra Crispy 10 Bolster Fire (2) 3 +33% chance for Simmer and Boil damage ticks to last an extra round. Molten Weapons 10 Bolster Fire (1) 2 +40% to the Power of Fire Weapon Enchants. Bolster Storm 10 Ability: Gust (1) 2 +20% of equipped weapon Enchant Power added to Plus Storm. 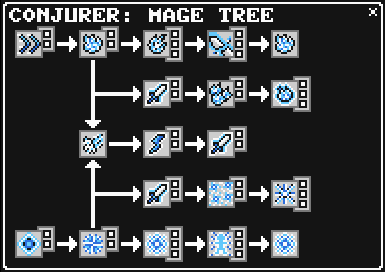 Freezing Weapons 10 Bolster Ice (1) 2 +40% to the Power of Ice Weapon Enchants. Hypothermic 10 Bolster Ice (2) 3 +33% chance for Shiver and Chill damage ticks to last an extra round. Wither 15 Extra Crispy (2) 3 +5% chance for Simmer and Boil to inflict Weaken. Heat Up 15 Molten Weapons (1) 2 +1 to the Plus Fire Cap of all Fire spells for every 3 levels. Electrified Weapons 15 Bolster Storm (1) 2 +40% to the Power of Storm Weapon Enchants. Cool Down 15 Frozen Weapons (1) 2 +1 to the Plus Ice Cap of all Ice spells for every 3 levels. Frozen Solid 15 Hypothermic (2) 3 +5% chance for Shiver and Chill to inflict Stun. Ability: Boil 25 Wither (2) 1 Inflicts Fire damage over several rounds. Fire Power 25 Heat Up (2) 3 +8% to the Power of all Fire abilities. Ice Power 25 Cool Down (2) 3 +8% to the Power of all Ice abilities. Ability: Chill 25 Frozen Solid (2) 1 Inflicts Ice damage over several rounds. Shortened Span - - 3 +10% chance for Renew spells to end an active damage over time spell. Holy Shield - - 3 +33% chance for Shield to also bestow Bless. Stamina 5 Shortened Span (2) 3 +1 to Max HP for every 2 levels. Wisdom 5 Holy Shield (2) 3 +1 to Max MP for every 2 levels. Ability: Vivify 10 Stamina (1) 1 Dispels Sleep and Confuse. Renewable Power 10 Stamina (2) 3 +3% to the Power of all Heal spells. Exasperate 10 Comatose (1) 2 +5% chance to inflict Sleep on attacking foes. Comatose 10 Wisdom (1) 2 +25 to the damage threshold of all Sleep statuses inflicted. Ability: Consume 10 Wisdom (1) 1 Steals MP, Will, Rage etc., returned as MP. Rejuvenate 15 Ability: Vivify (1) 2 +25% chance for Vivify to also generate an active Renew spell. Master Healer 15 Renewable Power (2) 3 +33% to the Plus Heal Cap of all Renew spells. Extended Recovery 15 Master Healer (2) 3 +33% chance for all Renew healing ticks to last an extra round. Night Terrors 15 Comatose (2) 2 +20% to the Power of Nightmare. Benediction 25 Ability: RenewMost (1) 2 +25% chance for all Renew and Redeem spells to also bestow Bless. Ability: RenewMost 25 Master Healer (1) 1 Heals for a large amount of HP over several rounds. Second Chance 25 Extended Recovery 2 +15% to Redeem's Rate and HP healed upon Revival. Siphon Energy 25 Ability: Consume (1) 2 +10% to the amount of MP, Rage, etc. stolen by Consume. Simmer 5 1 Inflicts fire damage over time on a single target. Renew 5 2 Heals an ally for a small amount of HP over time. Shield 8 4 Boosts the speed and defense of the caster. Shiver 5 5 Inflicts ice damage over time on a single target. Detox 7 8 Dispels the poison status from an ally. Sleep 4 10 Chance to sleep a single target. RenewMore 15 11 Heals an ally for a moderate amount of HP over time. Recall 2 13 Used in the overworld; returns the party to the last town visited. Nightmare 12 15 Inflicts major direct damage on a single sleeping target. Dream 3 16 Awakens a sleeping ally and heals all allies. Redeem 21 20 40% base chance to revive one ally from death. RenewWave 25 23 Heals all allies for a small amount of HP over time. Gust 3 5 Inflicts direct storm damage on a single target. Boil 15 25 Inflicts fire damage over time on all enemies. Chill 15 25 Inflicts ice damage over time on all enemies. Vivify 5 10 Dispels both sleep and confuse from all allies. RenewMost 25 25 Heals an ally for a large amount of HP over time.